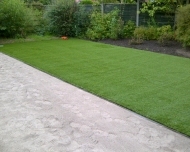 Evergreen have expert Knowledge in all aspects of hard and soft landscaping. It is essential to have a solid foundation for all retaining walls, in this instance we poured a concrete footing. 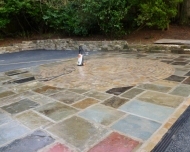 Once this had cured we had our first 10 tonne of reclaimed stone delivered. This is then hand picked and sorted into courses of the same thickness ready for laying. As the height of the banking varied at this particular site, we stepped the wall accordingly. 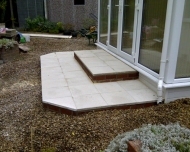 The yorkstone flagging and tarmac were laid up to the wall giving a finished product.